Journey through an exploration of Boeing’s impact on Seattle over 100 years, from flying boats on Lake Union to the launch of the Dreamliner. 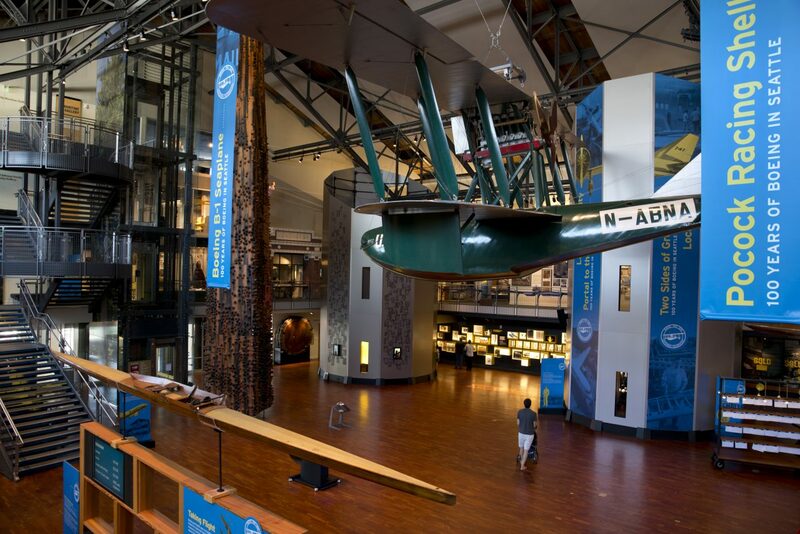 Coinciding with the 100th birthday of Boeing’s founding, MOHAI visitors travel through True Northwest and the Bezos Center for Innovation galleries and rediscover Seattle’s history through the lens of the company’s first century. And opportunities to leave behind personal Boeing memories. Before the Boeing B-1 aircraft there were the Pocock Racing Shells, pictured here in the lower left, which were an early model for seaplanes. Bill Boeing was impressed by brothers Richard and George Pocock’s work building racing boats for the University of Washington, and in 1916, the brothers transferred their skills in designing and transforming shells to seaplane pontoons. 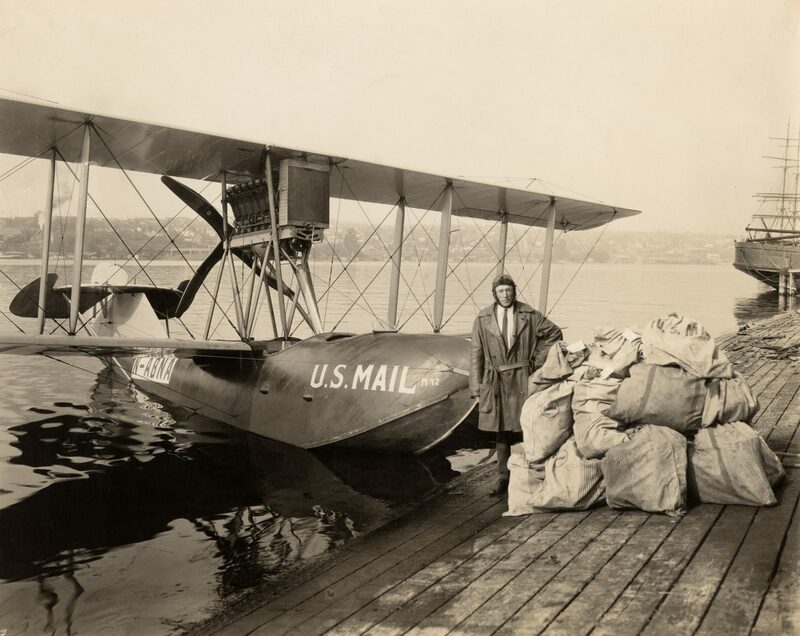 The Boeing B-1 was the company’s first commercial plan, and took off from Lake Union in 1919. In 1920, entrepreneur and pilot Eddie Hubbard used this plane for the world’s first regularly scheduled international airmail service. It only took him fifty- eight minutes to make the trip from Lake Union to Victoria, British Columbia. The B-1 was later retired in 1927. The Boeing B-1 aircraft now hangs in MOHAI’s Grand Atrium. As men went off to fight in World War II, women stepped up and started working at the assembly lines. 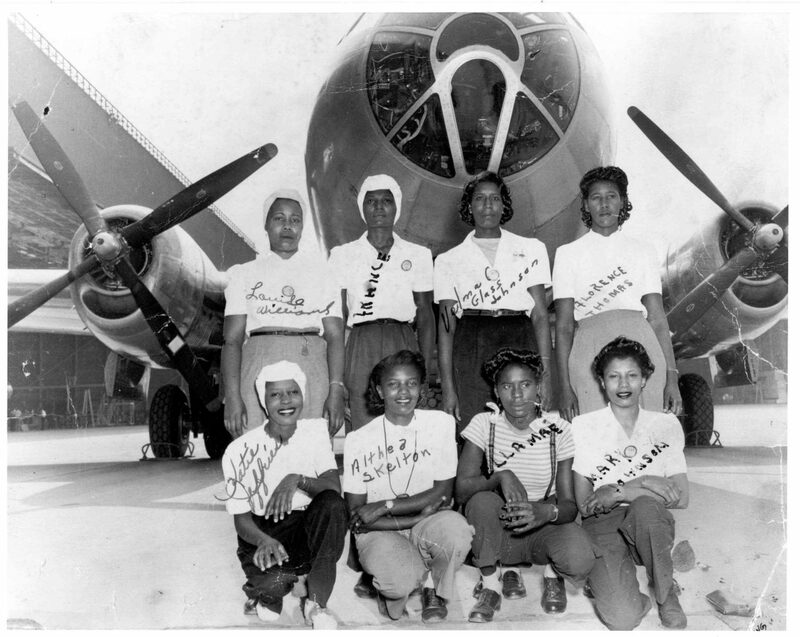 During the War, more than half of Boeing’s employees on the factory lines were women, and 10% of those women were African American. The women shown here worked on B-29 airplanes. On June 26, 1950, hydroplane Slo-mo-shun IV, now hanging in the Grand Atrium, set a mile straightaway record of 160.323 miles per hour. Ted Jones and many people on the pit crew had day jobs at Boeing and applied their aviation skills to the exhilarating speed of hydroplanes “flying low” on the lake. Hear selected stories of Boeing’s history from people who were there. To commemorate the centennial, MOHAI has collected one hundred oral histories from engineers, assembly workers, executives and others who have firsthand experience with the Boeing story. Check out these highlights. Inez Towner’s 32 years at Boeing began in 1968 when she worked on Panel Maintenance for the first 747 and became one of the group of dedicated employees known as “the Incredibles.” Her career includes positions working in Procurement Coding, Manufacturing Planning, and, currently, Systems and Environmental Control. She has also helped form the Boeing American Indian Society in 2006. Inez talks about her early days at Boeing in this clip. Captain Randy Neville retired as a Chief Model Pilot for the Boeing 787 Dreamliner, after a 20 year career as a test pilot for Boeing. Notably, he was the primary test pilot for the F-22 raptor, where he still holds one of the highest records for flight time. Prior to his work at Boeing, he spent 20 years as a pilot in the US Air Force. Randy talks about flying over Mount St. Helens as it erupted. Alan Mulally is the former President and CEO of Boeing Commercial Airplanes (1998-2006), and in that role was responsible for all of the company’s commercial airplane programs and related services. Alan began his career with Boeing in 1969 and progressed through a number of significant engineering and program-management assignments, including contributions on the 727, 737, 747, 757, 767, 777 and 787 airplanes as well as IT, space and defense programs. In this clip, Alan talks about working with the community. Abe retired as President of what was then called the Boeing Military Airplane Company (now Boeing Defense Systems) in 1989 after a 38 year career. He was the chief design engineer on the company’s AGM-69 short-range missile system and the B-1 avionics system, among other achievements. In this clip, Abe speaks about the impact of the bombing of Pearl Harbor had on him as a teenager in Hawaii, and his eventual time in the military where he flew in Boeing B-17s during World War II. Phil Condit is the former President, Chief Executive Officer, and Chairman of the Board of The Boeing Company. He joined Boeing in 1965 as an aerodynamics engineer and subsequently held more than 20 different leadership positions. Under Phil’s leadership, several mergers and acquisitions, including with McDonnell Douglas and with Rockwell aerospace and defense units, transformed the company into a global enterprise with breadth and depth. In this video, he talks about Boeing’s willingness to take risks. Laura Bogusch has held many different engineering and managerial positions in her 19 years at Boeing and is currently the Director of Architecture, Capabilities, and Systems. She helped develop the conceptual design, tooling, fabrication, and evaluation for the composite fuselage production for the 787. Laura discusses creating the light weight and strong composite material that is used in the 787. Tommy worked at Boeing since 2011 and is a Tool Maker with expertise in lean manufacturing and 3D printing technology. In this clip, Tommy discusses the advantages of 3D printing and talks about the first tool he made for Boeing using a 3D printer.